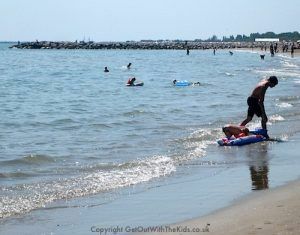 Ca’Savio is an excellent holiday park, with direct access to the beach. 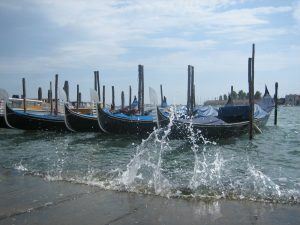 It is very close by to Punta Sabbioni, so you’re just a ferry ride from the world famous Venice. We thoroughly enjoyed our stay at Ca’Savio and can really recommend it. 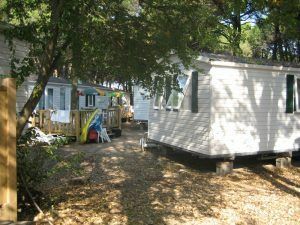 If you are staying with Eurocamp you can choose from different types of 2 bedroom or a 3 bedroom static caravan. We chose a 3 bedroom, which was brand new and fitted to a high standard, and came with a deck that was great for family dining al fresco at night. The Eurocamp vans are nestled under trees, so some protection from all of the midday sun, and are arranged “ad hoc” and not in rows as seen on many UK campsites. Eurocamp also provide their Classic Tent that can be arranged to either have two or three bedrooms. In addition to the provided Eurocamp accommodation, there are pitches available for tents and mobile homes. (Officially there are 1500 pitches). These pitches are organised in rows, and also have good tree cover. The ground though is mainly sand, with some gravel, so be prepared if bringing your own tent to use tent pegs suitable for sand. When we visited there were other UK visitors who had come down by caravan, camper van, or motor home. 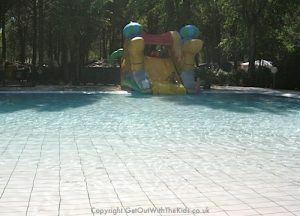 Camping Ca’Savio has a number of pools – 5 in total, though two of them are toddler pools. 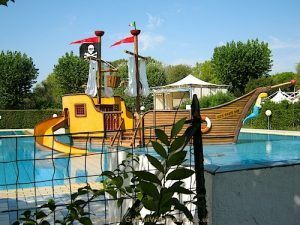 At the main complex is the large family pool with a big pirate ship slide. This was always popular with the kids. Next to that there is a shallower toddler pool. We went in August and there were some inflatable water slides that the smaller kids loved. Slightly away from the main complex there is another pool. 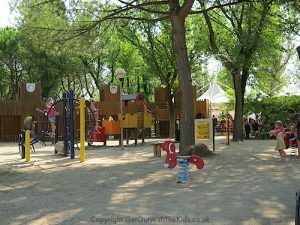 This isn’t far from the Eurocamp caravans, and can be a bit quieter (with some great sun traps for sunbathers). This has a larger pool (aqua-aerobics is good fun there), and a large toddler pool, complete with water fountains and another inflatable slide. The pools do close for a siesta at midday (this is good to be honest as it gets very hot and closing the pools gets people out the of the midday sun). They also close a pool one day a week for a thorough clean. Ca’Savio has a huge playground with an adventure fort. This was extremely popular with kids. Ca’Savio is also right on the beach. You can walk direct from your caravan to the (hot) sandy beach. The beach was very large and kept clean. Pedalos and the usual water sports are available. There’s also a large pirate ship that comes into piers at the beach. This is an excursion that can be booked at Ca’Savio. It’s also possible to hire bikes at the campsite. There are some villages and quiet roads to explore. A Eurocamp guide informed us of some good road free cycle routes that go along the shores of Venice lagoon. Eurocamp have children’s clubs from the ages of 4 through to 17. We were so busy when we stayed that we never directly used the clubs, though the staff did put on kids activities at other times, and were very good with the kids. These kids clubs by the way are FREE OF CHARGE, so ideal if you want a bit of time to yourself. There is also a children’s disco (during high season) and family entertainment in the evening. (When we visited the Vigorboard was very popular, and a lot of kids were making use of that in the evening). There is a small on-site supermarket. Whilst, as you would expect, prices may not be the very cheapest, compared to many other places we visited we found the shop quite reasonable. We must recommend the wine. In fact, you can get it on tap if you bring your own containers to the supermarket. They even did Ca’Savio branded wine (which wasn’t bad and a bottle was kept back for Christmas). I must also mention the spaghetti. There was a whole row of different spaghetti, all numbered in different sizes. Amazing! Self catering is fine, but Ca’Savio also has a great Pizzeria. For a family of 5 we found the restaurant reasonably priced and the food excellent. You can also order fresh stone baked pizzas to take away. Compared to take-away pizzas in the UK these are amazing (sorry, using that word a lot!). Pizza night in Italy: really tasty fresh pizzas, excellent local wine, and eating outside. Rumble Truck – this was the star. 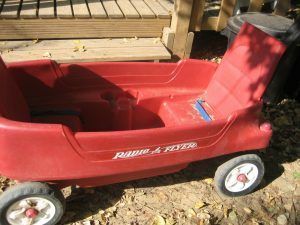 It can take two toddlers, or the seat folds flat and so is good as a pull-along truck for taking buckets and spades to the beach. Here's how you can get in contact with Ca'Savio campsite. Camping Ca'Savio, Via di Ca'Savio, 77 30013 Cavallino-Treporti. The nearest airport is Venice (VCE), which is about 41km away. We flew into Venice with Jet2. If the weather and approach is right then this is a good flight for a window seat, as you fly over the Alps and then get a view of Venice itself before you land. As mentioned earlier, you can self-drive to Ca’Savio (and some others from the UK had done so). Technically the nearest ferry port if you are travelling from the UK is Zeebrugge, although that is 1334km away from the campsite! One reviewer on Trip Advisor recommends taking the train. We had also looked at a motor home hire, flying into Switzerland or Austria, touring the Alps, and then down to Ca’Savio, but decided in the end to spend the whole holiday in Ca’Savio. If you want to explore further afield then a car will be ideal but having a car is not necessary. We took a private taxi mini-bus to and from the airport (around €90 if I recall), and used public transport to visit Venice. Ca’Savio and Eurocamp staff were very helpful in getting tickets and providing directions and information. Ferries can become busy, and you’ll need to keep an eye on the kids. The ferry goes directly to Venice, to the main ferry terminus just outside St. Mark’s square (near the Bridge of Sighs), on the Grand Canal. Venice was not designed with push chairs in mind. There are a lot of narrow streets and little bridges with steps. It is doable with a push chair (we did it), but not as enjoyable. Food and drink is very expensive – take yours with you. Do not buy in the main tourist areas such as St. Mark’s Square. However, down some of the back streets, take-away pizza slices and ice cream are slightly more affordable, even if still considerably more expensive than Camping Ca’Savio. It gets very busy in high season. It also can get very hot and humid (and sometimes a bit smelly due to all the canal water). Get a guide book or map, and ideally read up on a few things before you go. This will make it more enjoyable and gives you a chance to see what you want to see. When we were there (though we didn’t realise at the time) it was the Venice film festival. There were huge luxury yachts mored up (actually, these were ships with their own yachts strapped too them) – we later found out these were some of the most expensive in the world that the rich and famous use. We sat and had our picnic by them (though there were a lot of security around them, as well as staff walking some ‘posh’ dogs). When we got home we later found out that Madonna, George Clooney, and others had arrived in them. Also near Ca’Savio is Aqualandia. This is a huge water slide park, and you can order tickets from Ca’Savio reception. Again, you can catch the bus just outside the park that will take you to the theme park. Eurocamp visitors gave Camping Ca’Savio 8.3 out of 10. A similar score was backed up by Trip Advisor customers who rated Camping Ca’Savio as 4 out of 5. 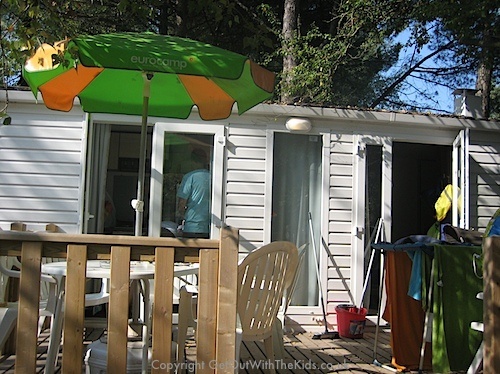 [pullquote style=”right”]”Myself, my partner and 3 children (age 6, 13, 15) went to Ca Savio for ten nights in August 2012. We went with Eurocamp and stayed in a 3 bed challet.”, Caroline[/wpsm_quote]The majority of Trip Advisor reviews are either ‘Excellent’ or ‘Very Good’. For us, we’ve given Camping Ca’Savio 4.5 out of 5. I think the Eurocamp accommodation we had was outstanding, and we had an excellent spot that wasn’t over looked. (We were glad we picked the caravan rather than the tent, which are pitched in rows). The only thing that didn’t give it a 5 out of 5 was the lack of air-conditioning available, though we got a good through draft in the van that made it a bit better. Mosquitos will be a problem at that time of year, but we had citronella candles and sprays. Some of us were hardly bit, but a few weren’t as lucky. On the whole, we would thoroughly recommend Ca’Savio. HI, thanks for the information , I cant wait to get to Ca’savio. I wondered if you could let me know if it would be best to travel from the airport ( Marco Polo di Venezia ) to ca’savio via Venice and the boats or if it would be better to drive round on the SS14. Which way did your taxi go ? We are hiring cars but also have children and fancy the easiest option for the first day. Yes, we flew in to the main Marco Polo airport and got a taxi bus to Ca’Savio. We pre-booked this from the UK, which saved us some money. At the time, it was 90 Euros each way. I think you could take the ferry, and it certainly would be a cool way to arrive in Venice, though I think it depends how much luggage you have. 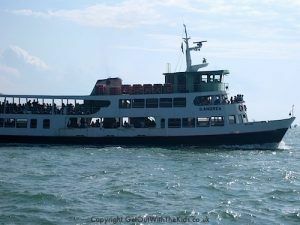 You’ll also need to catch the bus to Ca Savio when the ferry lands. 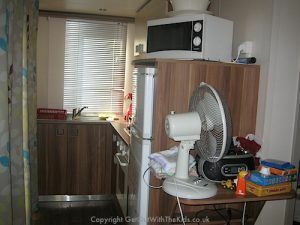 Hi we’re looking to take our toddler to Venice for a couple of nights but after reading this blood have decided to stay at this camp in September, I just want to know how easy and how long does it take to get to Venice on the bus and ferry? Hi Leanne I think it was about a 10 minute walk to the bus stop, a 10 minute bus ride, and I think it was about 30 mins on the ferry. Our youngest was 2 when we did it. Oh perfect thank you. Just weighing up our options. She will be 2 in September so was just worried with lots of people saying Venice is no place for a toddler. Also was it pretty easy to get to the camp from the airport I’ve priced it up with Euro camp and they want over £300 am certainly not paying that. That is steep. We booked transfers ourselves. It cost 90 Euros each way, which was about £50 or £60. I suspect it would cost more now. If you are taking a pushchair it can be difficult as Venice has a lot of small bridges with steps, so there’s a lot of lifting the chair. We learnt that the hard way. It didn’t stop us visiting a few times though. It’s mainly a problem exploring the back streets but they are well worth visiting. You can find places to buy pizza slices to take with you – though food in Venice is expensive and it’s cheaper to take food with you from the campsite. A flatter area to take a pushchair is if you follow the canal on the right as you face St Marks square. That will take you to a big park area. We really enjoyed Ca Savio. You could explore Venice and have all the things kids like such as the pools and beech. The pizza restaurant at the campsite was very good too. 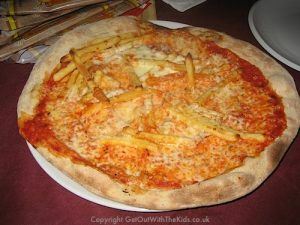 Mind you, we’ve never had a bad pizza in Italy.